Jib Strategic Marketing sponsored the Cult Classics Group Art Show at Hashtag Gallery this month, November 2014. Opening Night was Thursday 06 Nov 2014. The place was jammed from 7pm till 11:30pm when they stopped serving drinks at the bar. There were ninety three pieces of art, the creative product of thirty six artists who submitted work in accordance with the ‘Cult Classic’ theme. Here’s Claire Mathieson Brewster posing beside one of her ‘Sixes’. All her art had the theme of ‘6’ in the title concept or character name. The first picture was the most obscure, the male character from The Prisoner. 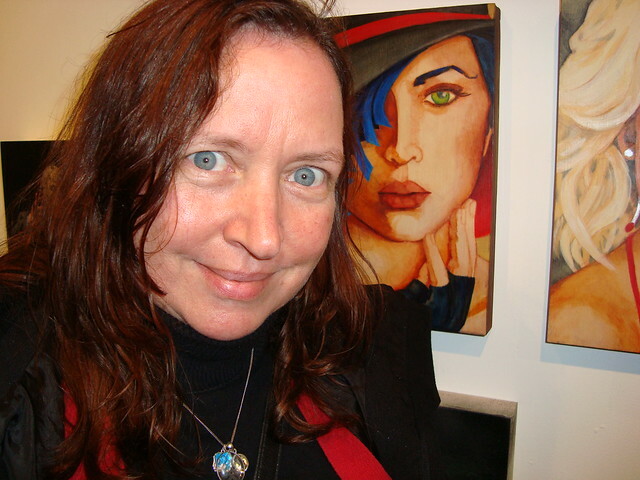 Claire likes to put small solid colour dots in her paintings, in earrings and eyes. I made her stand on a chair so I could get this shot of her face in front of her art, (I believe this is my best shot from the night). Hashtag Gallery is located at 801 Dundas St W, where it was started in April of 2012. The name #Hashtag correctly implies that these gallery owners are social media savvy web citizens who use online tools to help build large communities to which they successfully promote their art shows and sales. Johnny Hollick and Graeme Luey have large personal followings and their gallery’s web presence grows before, during and after every show because of the work they do online on behalf of local artists and the Toronto art scene. These guys started the gallery with a mandate to discover and help foster new talent by issuing open calls to artists every three months. Jib Strategic came on board in July 2014, and now again here in November to sponsor the open calls by offering to buy the one painting that the online community deems ‘best in show’. Visitors to the Hashtag Gallery website voted for their favourite pieces, generating over 7,300 votes over the course of the 3 day poll. 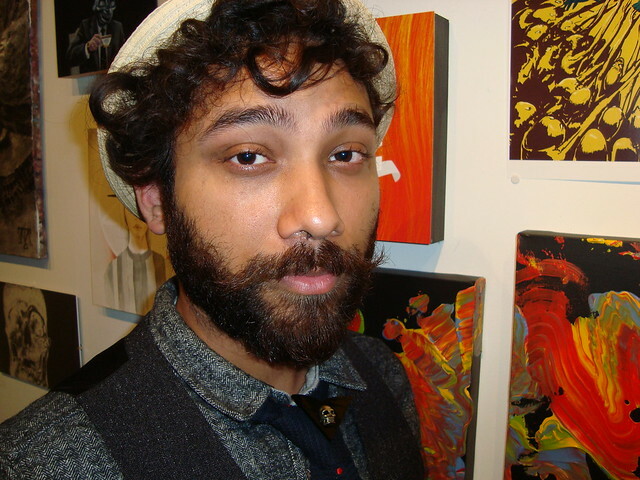 Johnny Hollicks is one of the owners and tonight, one of the thirty six different artists with artwork on display. 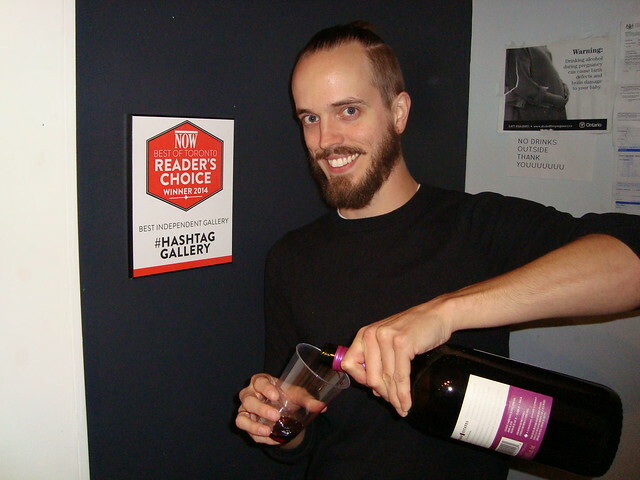 As you can see in this photo, Hashtag Gallery was recently deemed to be the Best Independent Art Gallery in Toronto and the write-up extolls the virtues of the establishment, praising their social media prowess and packed art openings. This is a very big deal as there are hundreds of art galleries in this city, in much more expensive neighbourhoods, that would love the attention such a designation could bring them. The weather outside was horrible. It was a night of cold, wet November rain that punishes anyone who isn’t bundled up beyond recognition. Another barrier to entry and overall attendance was the fact that the street outside the venue is closed. The paved roadway has been commandeered by the Toronto Transit Commission as a construction equipment storage and assembly zone for streetcar track replacement work they’re doing around the corner on Bathurst. Nikkie Stinchcombe of Little Paper Forest, cut illustrations is back for another open Show at Hashtag. This girl rocked the Retro Future show with space girl theme pieces. 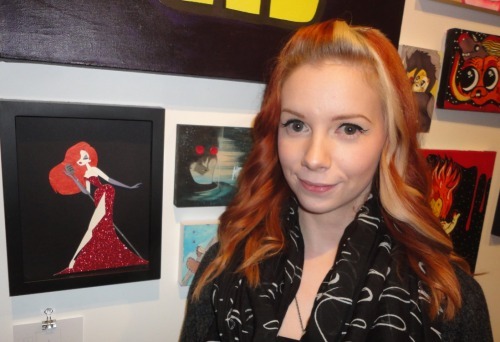 Here she is beside her Jessica Rabbit inspired creation. This young lady is embarking on a promising career as a freelance illustrator. Currently based in Oakville, Ontario she looks for opportunities to do sketches, posters and most particularly she loves doing innovative pop-up art illustrations for children’s books. Here’s Jackie Belonzo. She doesnt have a website that I could find, but I did locate her Jackie Belonzo at Deviant Art profile page and knew it was her when I spotted the her art, a piece which she called “I Skeletor” which was on display at the show which you can clearly see on the wall behind her in this picture of Jackie and her sister? I’m thinking that’s her little sister behind her. There are pieces of all sizes for sale in the gallery until Sunday Nov 9th 2014. All artwork is priced under $300, and the show was very typical in that it features works from both established and emerging artists who hope to get their artwork noticed. Who Won Best in Show ? Chris Austin’s Big Lebowski won the Best In Show designation and will be procured by Jib Strategic to hang in a position of honour in the office. Maybe this is a good piece for the office kitchen? 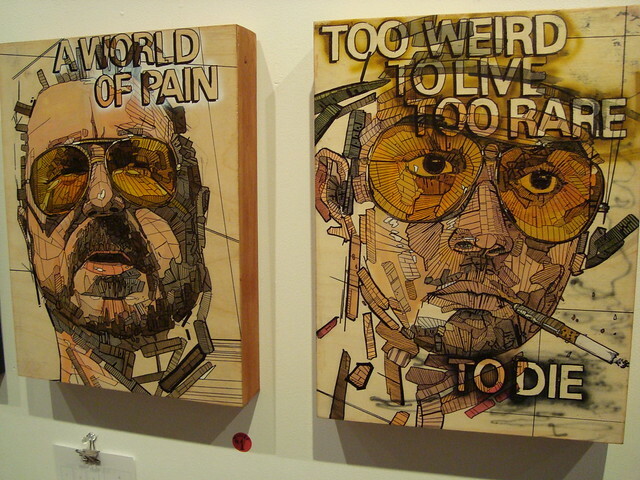 The picture to the right shows two pieces that Chris Austin submitted, the winner being the one on the left that shows John Goodman in the cult classic Big Lebowski role. The one on the right shows Johnny Depp playing Raoul Duke from Fear and Loathing in Las Vegas. Incidentally the common denominator here is the yellow hunting glasses which is an effect that Chris has clearly mastered and uses to great affect in his work. Of the 7,372 electronic votes cast, Chris’s piece earned the most, approx 2000 which was about 28% of all votes cast. This piece to be hung on the wall with care, here in the Jib Strategic office.